Download "An Archipelago which consists of 10 Islands each with their own distinct features and beauty. Discovered in 1640 by Diogo Gomes, a Portuguese"
3 An Archipelago which consists of 10 Islands each with their own distinct features and beauty. Discovered in 1640 by Diogo Gomes, a Portuguese explorer - Cape Verde is situated on the Atlantic Ocean - just 600 kilometres off the West African Coast. 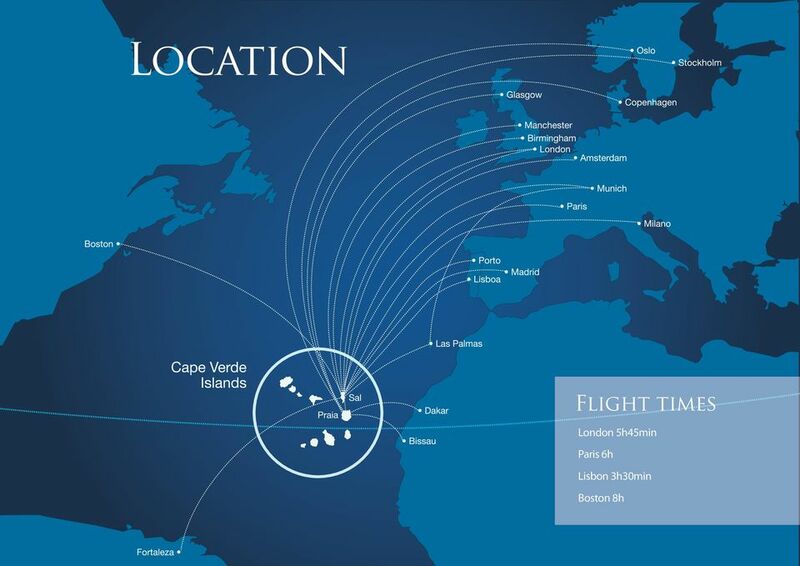 Cape Verde is on the same latitude as the Caribbean, blessing the Islands with perfect year round weather conditions, temperatures that range between 22ºC and 26ºC with virtually no rainfall, being the closest tropical destination to Europe, with a flight time from London of just 5.5 Hours. 6 Prepare yourself for a unique experience The Cape Verde Islands have modern international airports on many of the islands, advanced telecommunications (for example on Sal Island-wide WIFI), good road and transport links between towns, and efficient education and health system. 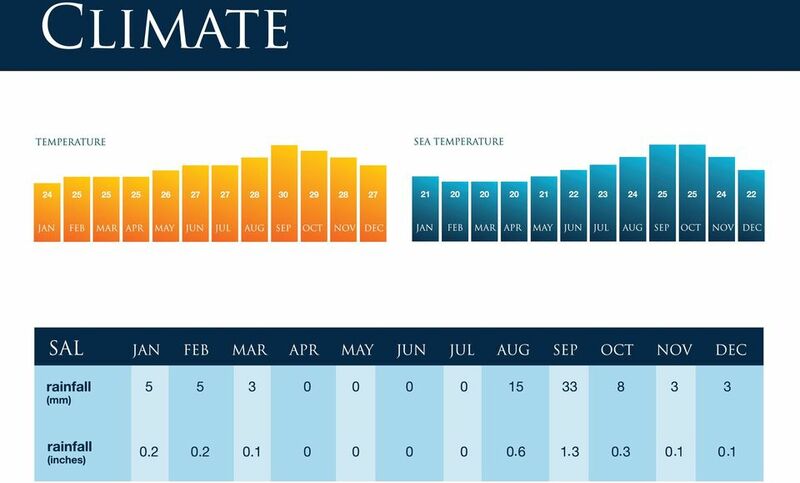 With a stable political structure and total Government commitment to tourism, Cape Verde has enjoyed substantial economic growth over the last few years. The official language is Portuguese, although the local Criole language is also widely used. 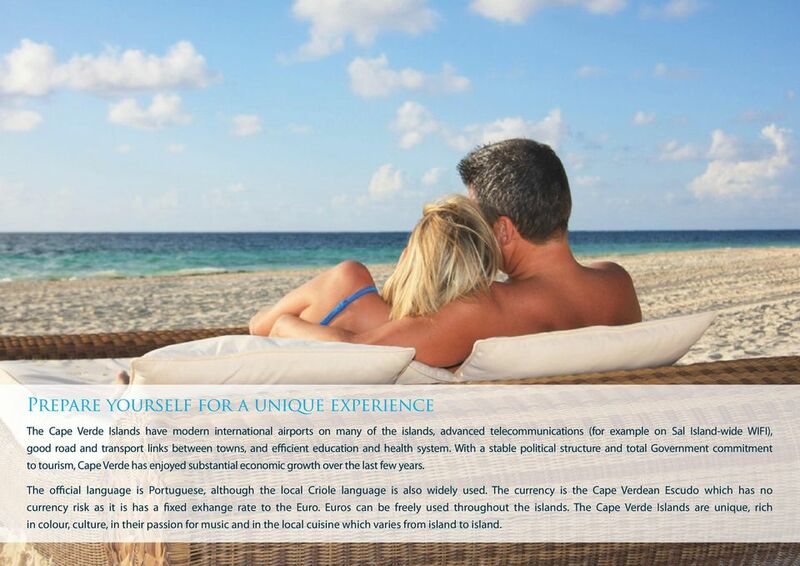 The currency is the Cape Verdean Escudo which has no currency risk as it is has a fixed exhange rate to the Euro. Euros can be freely used throughout the islands. The Cape Verde Islands are unique, rich in colour, culture, in their passion for music and in the local cuisine which varies from island to island. 8 Being the most cosmopolitan of all of the Cape Verde Islands, with a total size of just 215km2, and a population around 20,000, Sal s economic good fortunes began in the middle of the 19th Century when the natural salt production was at its peak (where Sal gets its name of course). 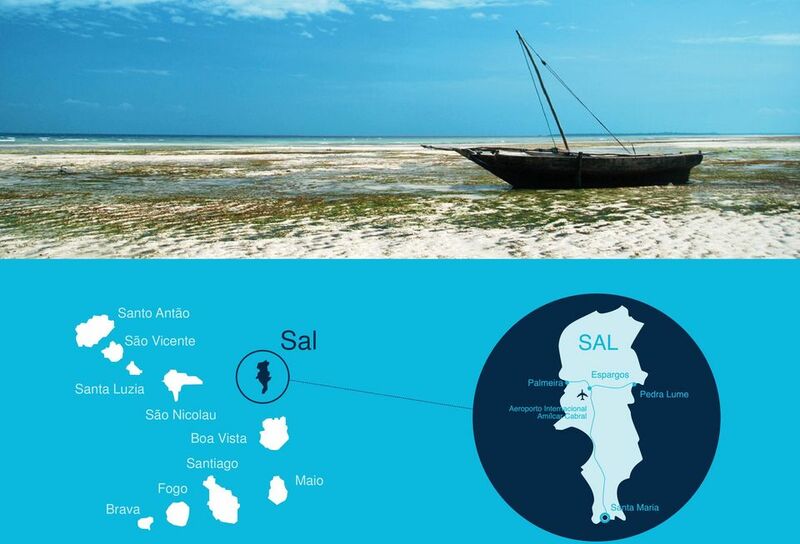 With commercial salt mining long gone - Sal s current and future prosperity is wholly linked to tourism- the excellent international airport, the magnificence of the turquoise seas, the food, the music, and the warmth of the Cape Verdean people. 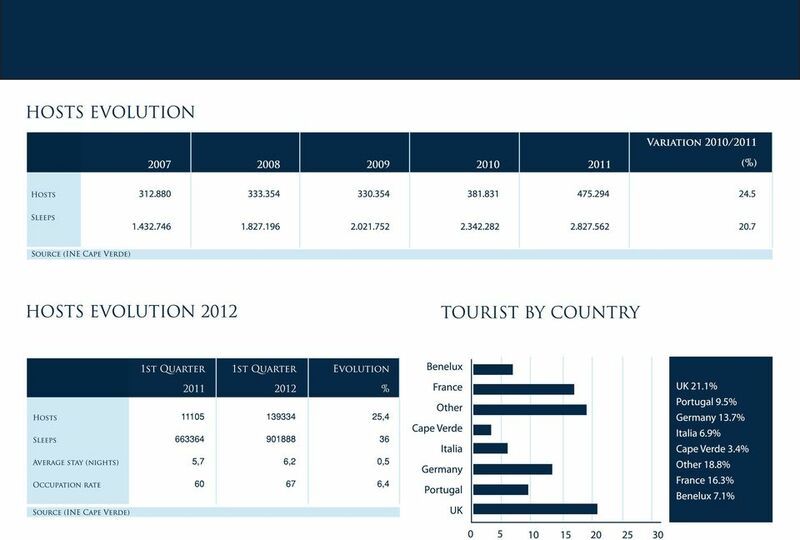 Unsurprisingly - investment in tourism is substantial and with the arrival of international recognised groups, elevating the status of this once little known Island, into one of the worlds top tourist destinations. 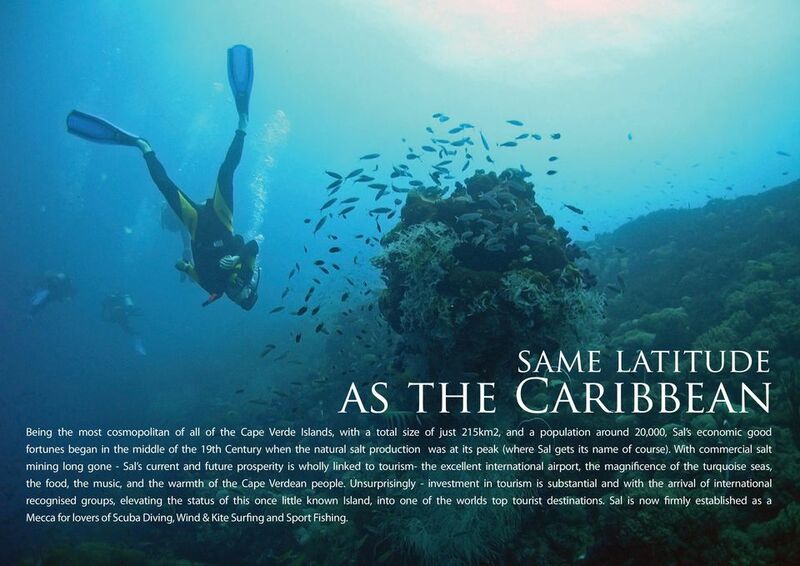 Sal is now firmly established as a Mecca for lovers of Scuba Diving, Wind & Kite Surfing and Sport Fishing. 9 The resort is classified as a European standard 5 Star Resort - frontline on Santa Maria Beach in the established tourist area, close to the typical Cape Verdean town of Santa Maria. It s just a short 15 minute journey from Sal s international airport, which sits just south of the capital of Sal, Espargos. 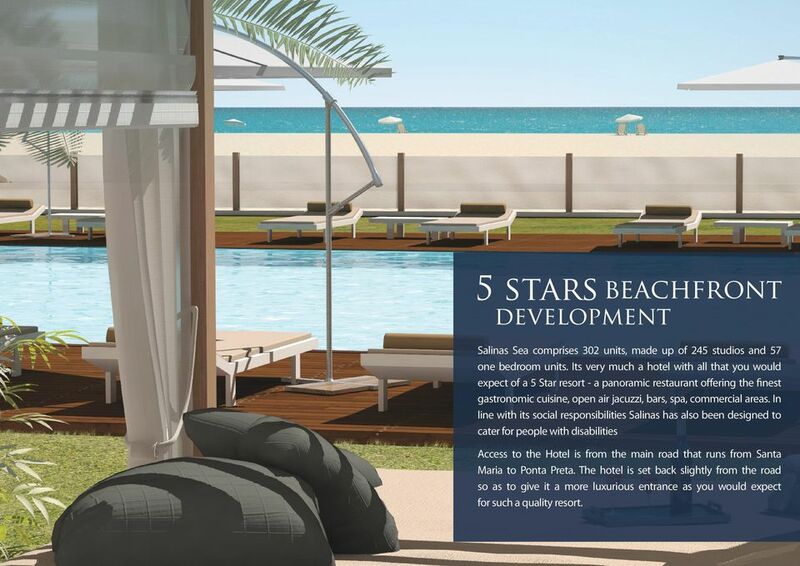 Salinas Sea Resort occupies 17,500 Square Metres on the finest beach location on Sal. 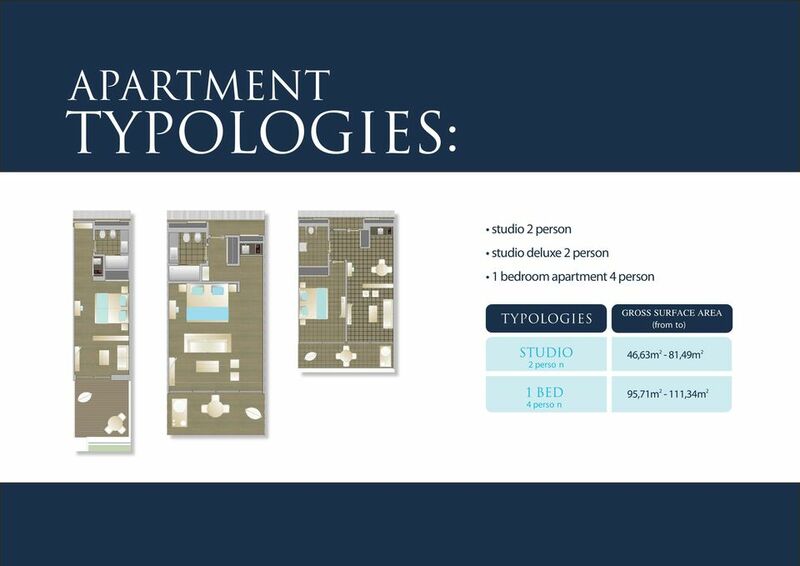 It consists of 302 apartments rooms - all finished to the highest standards. The site contour is considered as level. 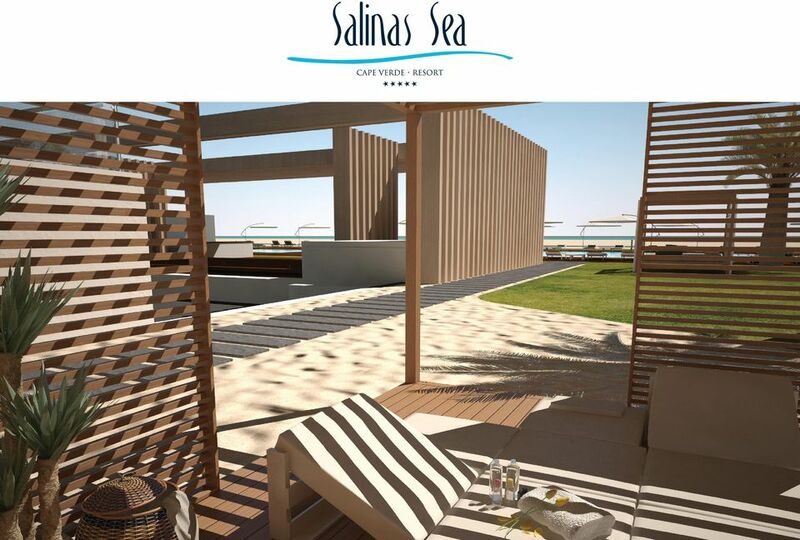 10 Salinas Sea is designed around a 3 wing structure, perpendicular to the water line - maximising the sea view aspects of all of the apartments. In line with the other frontline hotels on Santa Maria Beach - the resort is just 2 storeys high. Freshwater swimming pools are located to the front of the resort looking directly onto the crystal white sands of Santa Maria beach. 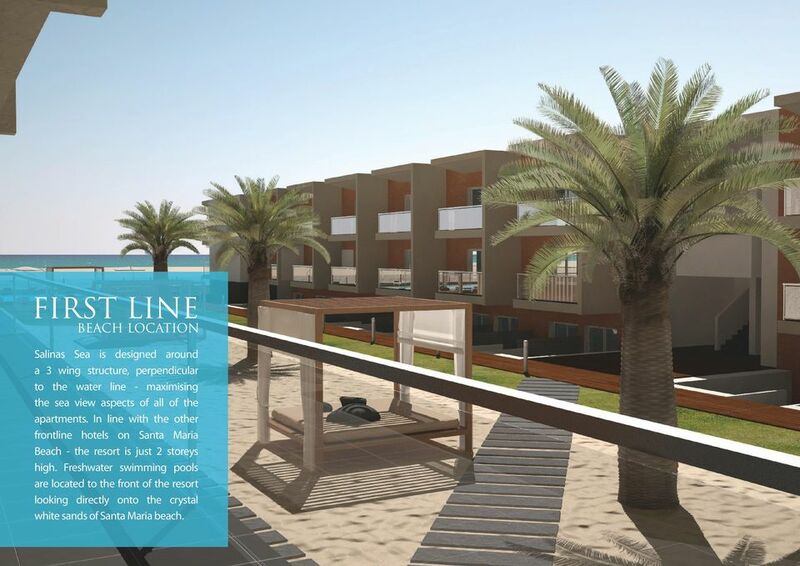 12 Salinas Sea comprises 302 units, made up of 245 studios and 57 one bedroom units. Its very much a hotel with all that you would expect of a 5 Star resort - a panoramic restaurant offering the finest gastronomic cuisine, open air jacuzzi, bars, spa, commercial areas. 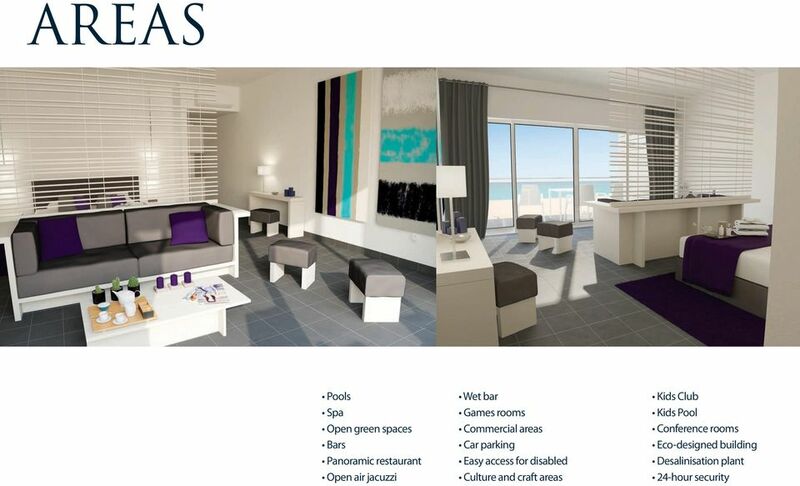 In line with its social responsibilities Salinas has also been designed to cater for people with disabilities Access to the Hotel is from the main road that runs from Santa Maria to Ponta Preta. The hotel is set back slightly from the road so as to give it a more luxurious entrance as you would expect for such a quality resort. 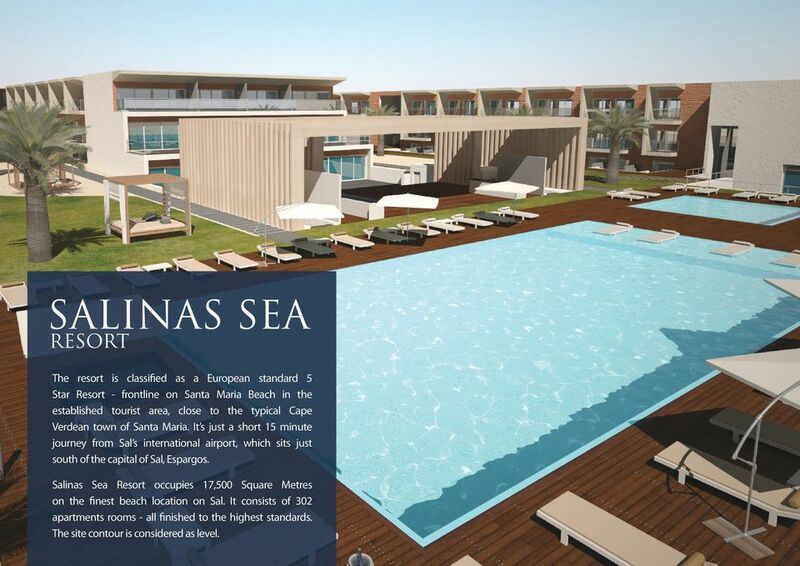 13 Salinas Sea will be the finest 5-star hotel in Cape Verde when it opens to the public. 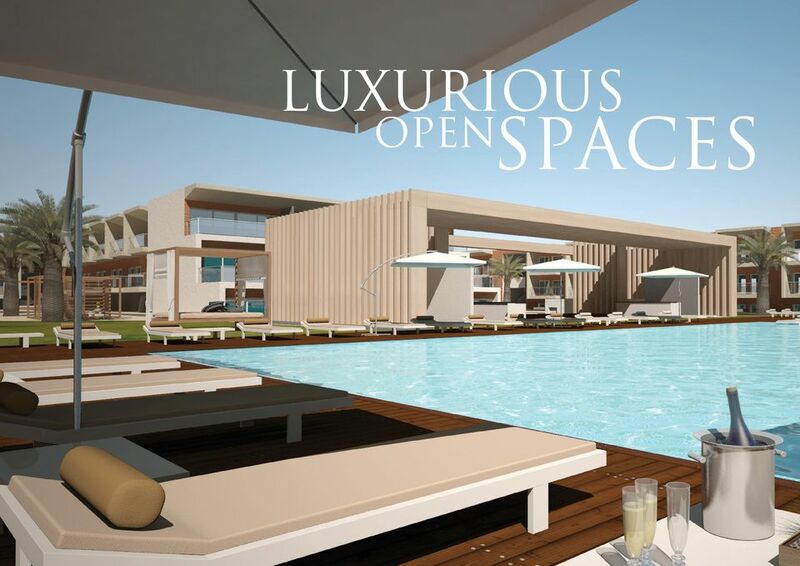 As would be expected, all internal and external fixtures and fittings will be of the highest quality so that our guests can enjoy their dream vacations and our investors exceptional yields. 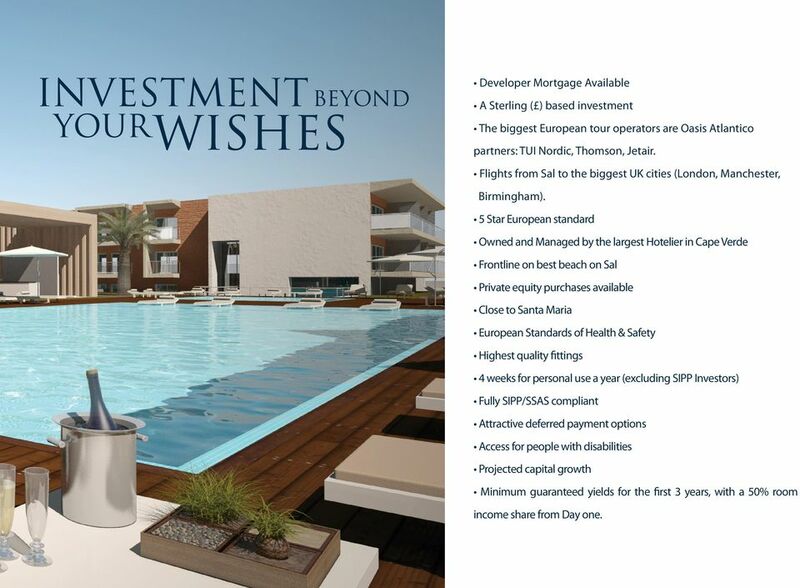 16 Developer Mortgage Available A Sterling ( ) based investment The biggest European tour operators are Oasis Atlantico partners: TUI Nordic, Thomson, Jetair. Flights from Sal to the biggest UK cities (London, Manchester, Birmingham). 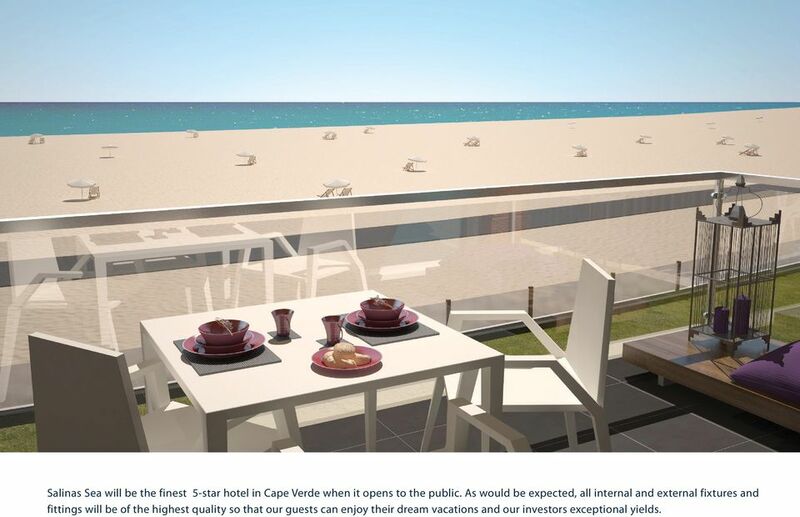 5 Star European standard Owned and Managed by the largest Hotelier in Cape Verde Frontline on best beach on Sal Private equity purchases available Close to Santa Maria European Standards of Health & Safety Highest quality fittings 4 weeks for personal use a year (excluding SIPP Investors) Fully SIPP/SSAS compliant Attractive deferred payment options Access for people with disabilities Projected capital growth Minimum guaranteed yields for the first 3 years, with a 50% room income share from Day one. 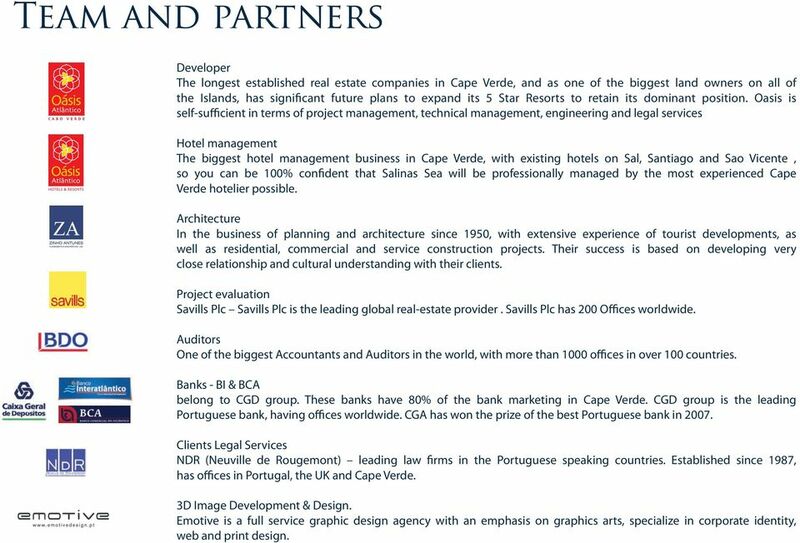 20 Developer The longest established real estate companies in Cape Verde, and as one of the biggest land owners on all of the Islands, has significant future plans to expand its 5 Star Resorts to retain its dominant position. 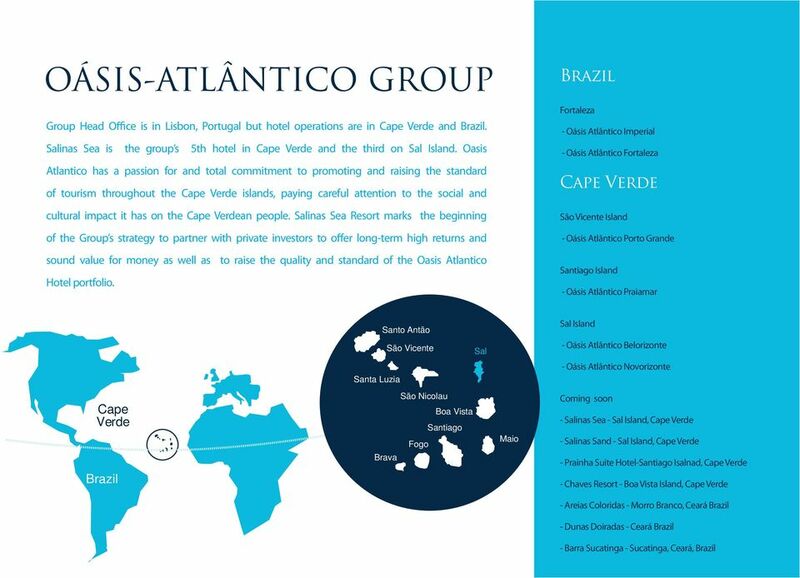 Oasis is self-sufficient in terms of project management, technical management, engineering and legal services Hotel management The biggest hotel management business in Cape Verde, with existing hotels on Sal, Santiago and Sao Vicente, so you can be 100% confident that Salinas Sea will be professionally managed by the most experienced Cape Verde hotelier possible. Architecture In the business of planning and architecture since 1950, with extensive experience of tourist developments, as well as residential, commercial and service construction projects. Their success is based on developing very close relationship and cultural understanding with their clients. Project evaluation Savills Plc Savills Plc is the leading global real-estate provider. Savills Plc has 200 Offices worldwide. Auditors One of the biggest Accountants and Auditors in the world, with more than 1000 offices in over 100 countries. Banks - BI & BCA belong to CGD group. These banks have 80% of the bank marketing in Cape Verde. CGD group is the leading Portuguese bank, having offices worldwide. CGA has won the prize of the best Portuguese bank in Clients Legal Services NDR (Neuville de Rougemont) leading law firms in the Portuguese speaking countries. 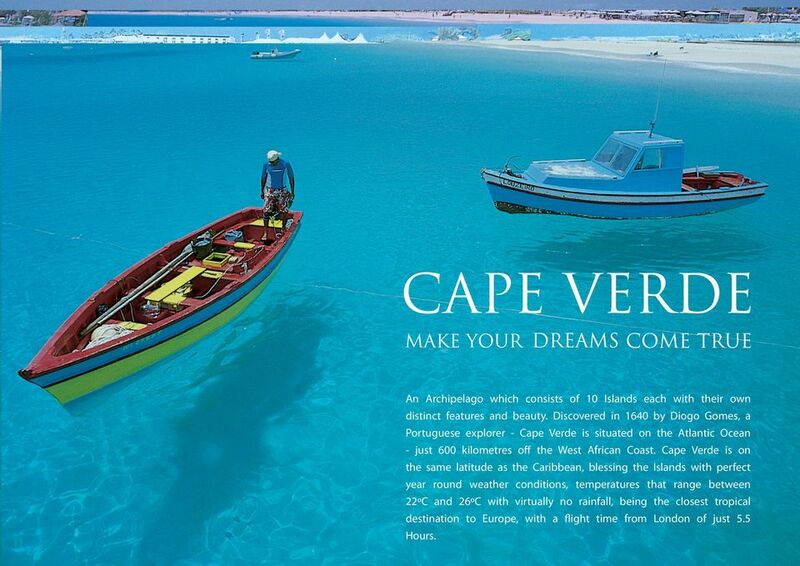 Established since 1987, has offices in Portugal, the UK and Cape Verde. 3D Image Development & Design. Emotive is a full service graphic design agency with an emphasis on graphics arts, specialize in corporate identity, web and print design. Intimate. Blissful. Paradise. A secluded world of remote bliss. An island resort in the heart of the Indian Ocean, where the sea sparkles and soft cushions of white sand reflect beautifully in the sunlight. WTM Why exhibit? 9,000 ** 50,000 ** Promote your business to the world. 2.5 billion * Find out more wtmlondon.com. More than. TIARA PARK ATLANTIC HOTEL * * * * * The Tiara Park Atlantic Porto has 232 rooms divided into 6 categories: deluxe room, executive room, deluxe suite, junior suite, diplomatic suite and presidential suite. EUROSTARS ROMA ӔTERNA HISTORY & LOCATION Rome is a 3.000 years vast open air museum, where culture, history and future perfectly merge to let locals and visitors be enchanted by this fantastic destination. The world s number one integrated leisure tourism business the new TUI About us Embarking on a new era The new TUI Group is a company of opportunities for our customers, our shareholders and our employees. hotel savoy. grado hotel savoy. grado hotel savoy. grado h hotel savoy grado hotel savoy. grado hotel savoy. grado hotel savoy. No ordinary place to eat! MINISTERIO DE DEFENSA SANTO DOMINGO, D.N. 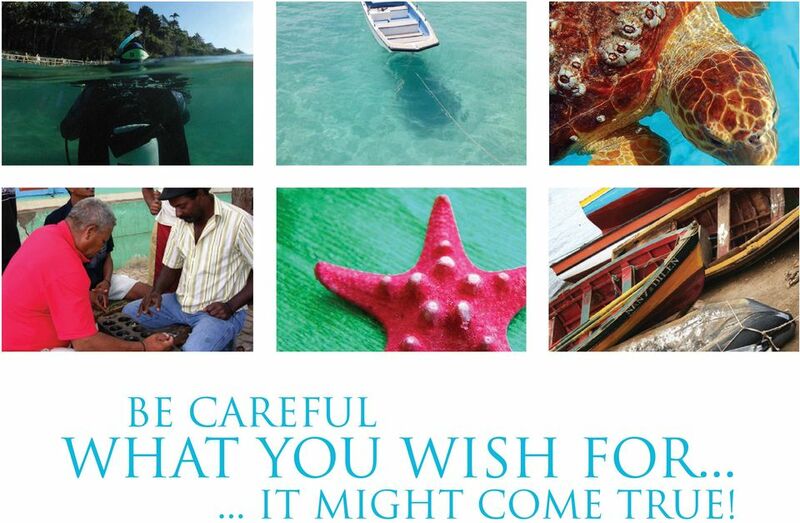 Reinventing Caribbean Tourism. David Redekop Principal Research Associate The Conference Board of Canada dredekop@conferenceboard.